Weaving in all your warp ends can take as long as the beading itself, can look messy and is a real pain. The best way to get around this is to just use one long strand of thread for the warp. Fasten the thread end to the screw with a slipknot or stick it down with strong tape, leaving a six inch tail for weaving in later. Wind the thread along the length of the loom as per usual, but after each pass through, wind around the end screw on each side. Make sure you wind in the same direction each time, wind in rows next to each other each time until the final row and fasten to the end screw or tape down with strong tape. 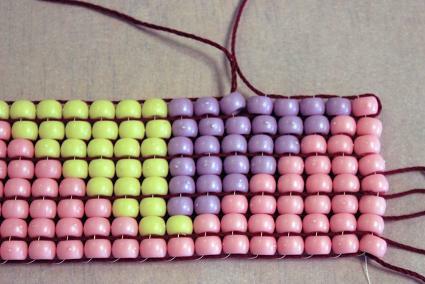 With a new strand of thread, fasten onto the fist strand of warp and bead as usual, passing the needle through your seed beads above the warp thread, over the last warp thread, then passing the needle over and below the warp thread through the same row of beads. Continue until you are at the end and bind off with a loose slipknot tying the weft thread to the last warp thread and cut leaving a six inch tail or binding temporarily with tape so that the beads don't fly off. When done, untie the thread knots on the screws or untape. Bind one end with a slipknot to the weft thread. Pull the other end of the warp thread gently through, one row at a time until tight, while holding the beadwork between your hands so that the beads don't move. This way, you will move through your work, getting more thread after each row is pulled tight till the end. You should have just one warp thread end on each side and one weft thread end on each side to weave into your work. You may want to use these ends to make a loop and thread a button to make a closure, if you are making a bracelet. With this method it is really important that you do not pierce the warp threads with your needle, or it won't pull through at the end. File down your needle with sandpaper or stone so that it isn't sharp and so does not split your thread. 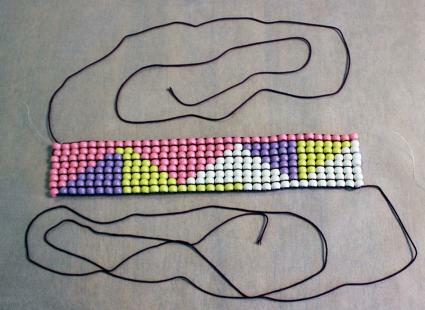 Make sure your seed beads are uniform in width and height or the results won't be great. 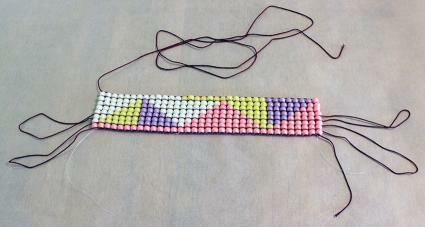 Delica seed beads are great for this. Do not use Nymo or any thread with "give" for loom beading as it is not slippery enough and your work will warp with wear. Dark thread looks best with loom beading (unless your beads are mostly white) as it shows between the beads. 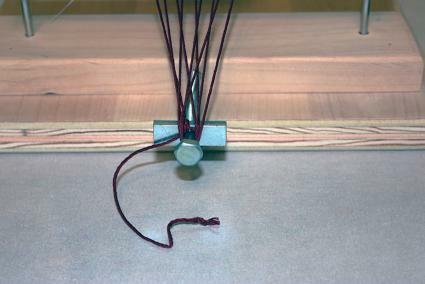 If you have trouble pulling the end warp thread through, pull it it through a few beads at a time, working down the length of the project straightening the beads that are pushed out of place.